Isolate IT! is the worlds largest distributor of Sorbothane products. With our unique relationship with Sorbothane we are able to design custom products. For over 30 years Sorbothane, Inc. has been – and will continue to be - the innovative and trusted choice of engineers worldwide for developing materials and components that isolate vibration, attenuate shock and damp unwanted noise. Since its beginning, Sorbothane, Inc. has been committed to producing superior American made products – that protect and improve the quality and enjoyment of life. Sorbothane, Inc. is located in Kent, Ohio and operates 10 specialized pouring machines. With 64,000 square feet of manufacturing space and supply support systems in place – the Sorbothane team stands ready to meet any production need. Sorbothane, Inc. has an engineering design staff that specializes in shock and vibration solutions plus an in-house testing and quality assurance lab. How efficient is Sorbothane as a vibration damper? Sorbothane® can absorb over 50% of the vibration energy over most of its temperature operating range at frequencies from 10 to 30,000 Hertz. How efficient is Sorbothane as a shock absorber? Where does the "Swallowed energy" "Absorbed energy" go? It is converted into a small amount of heat. How do I calculate weight load? What durometers of Sorbothane are available? Sorbothane® parts are normally cast between 30 and 70 durometer on the Shore “00” scale. For special applications (at increased cost) Sorbothane® can be cast as low as 20 durometer (limited strength) and as high as 80 durometer (limited visco-elastic properties). Warm water and mild soap. Rinse thoroughly and air dry. Do not soak. Wipe lightly with alcohol. Air dry. Do not soak. *Avoid the use of solvents. Consult engineering department with any questions. What is the shelf life of Sorbothane? For Sorbothane®: 3 years from date of pour if stored under approved storage conditions. For Pressure Sensitive Adhesives(PSA): 24 months from date of pour if stored under approved storage conditions. How should I store Sorbothane? Where can I download the Sorbothane Engineering design guide? 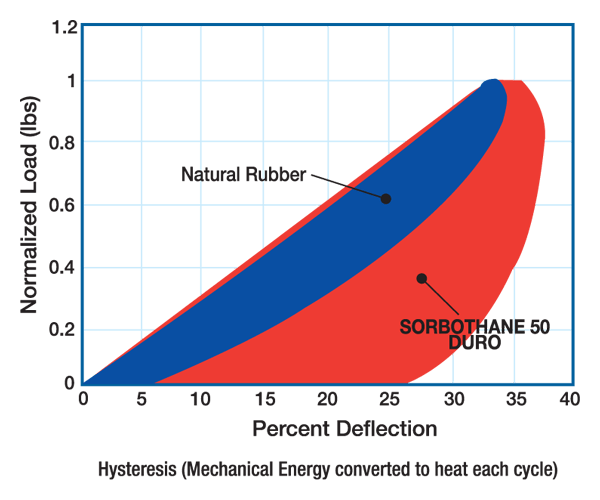 Sorbothane® turns mechanical energy into heat. As the material is deformed, molecular friction generates heat. This "lost energy" is called hysteresis. Energy is translated perpendicularly away from the axis of incidence, and its effect is pushed nearly 90° out of phase from the original disturbance. This phase shift, known as "Tan Delta," is a measure of Sorbothane's damping effectiveness. The higher the value of Tan Delta, the greater the amount of damping that occurs. High damping in a polymer reduces the impulse peak of a shock wave over a longer time frame. Sorbothane® reduces the impact force up to 80 percent, and brings the mass slowly to rest. A gradual deceleration affords better protection of delicate equipment. Sorbothane® exhibits very low rebound when compared to other materials. 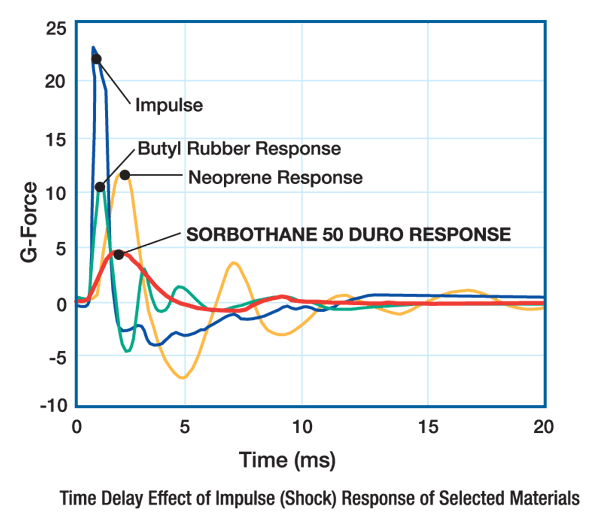 Low transmissibility (amplification) at resonance demonstrates the damping superiority of Sorbothane® over other elastomers. Low transmissibility means less damage to sensitive components. Isolation at large frequency ratios also shows a capacity to isolate vibration. This graph shows the high hysteresis necessary for efficient impact absorption. 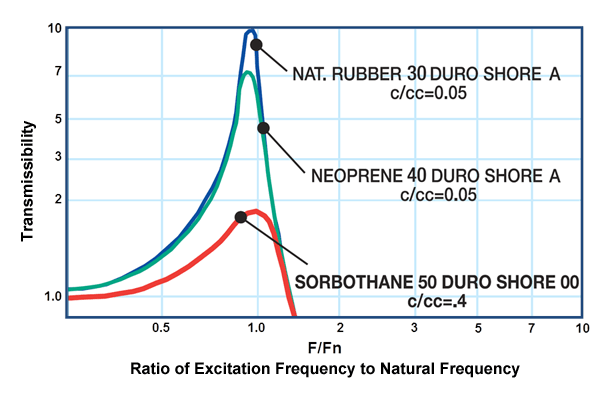 By comparing the area under the curves, it's clear Sorbothane® removes more of the impact energy from the system. Natural rubber is more elastic and returns energy to the system. High energy return causes high rebound and increases the potential for damage. Sorbothane® can decelerate parts and reduce peak forces during sudden stops in minimal sway space. Impact absorption up to 80 percent is achievable at proper dynamic deflections.